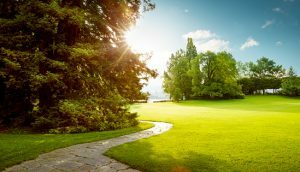 If you’re a local resident searching for the most in Hybla Valley Virginia lawn service, why not try the full service professionals at Complete Lawn Service? Complete Lawn does it all from lawns to landscapes, and we can take your ordinary outdoor space and turn it into an extraordinary one…a residence with curbside appeal that you’ll love coming home to. Better yet? Your home will have more resale value! Studies show that homes with professionally designed landscapes bring as much as a 15% greater return than comparable homes. Lawn and Shrub Care. We don’t just cut your grass…we mow, edge and weed-whip unreachable areas every two weeks, and we’ll change the mowing direction wherever the terrain permits. We offer a wide selection of lawn care programs that remove weeds and insects and create a thick, green lawn. Our several levels of shrub and bed care programs keeps your plants neatly trimmed and healthy looking. Landscapes and Hardscapes. We design a well-balanced arrangement of shrubs and plants that not only look great but provide healthy function as well. Complete Lawn’s hardscape designs employ walkways and patios that include an effective drainage system for healthier soil. Irrigation Systems. Keeping your lawn and plants watered is everything…that’s why our Certified Irrigation Designer will design a sprinkler system that distributes water evenly throughout your property, without waste or runoff. We stand behind our design and installation, and we can upgrade your system if needed. We help rid your property of pesky northern Virginia mosquitoes too, with an environment and pet-friendly oil spray that allows you to use your property right away. And in the winter months, we use our plows to dig you out of the snow and get you back in business. A complete, beautiful and functional lawn and landscape…our team does it all for residents in need of Hybla Valley Virginia lawn service. Contact us today for a free consultation, and let us get to work on creating an outdoor space that you’ll love!